Oral presentations will take place in the lecture hall 0.03 in the building of Faculty of Physics, University of Warsaw, 5 Pasteura Street at Ochota Campus. Oral presentation slot is 12 min+3 min for questions. We advise that you try your presentation several times to keep control on the timing. 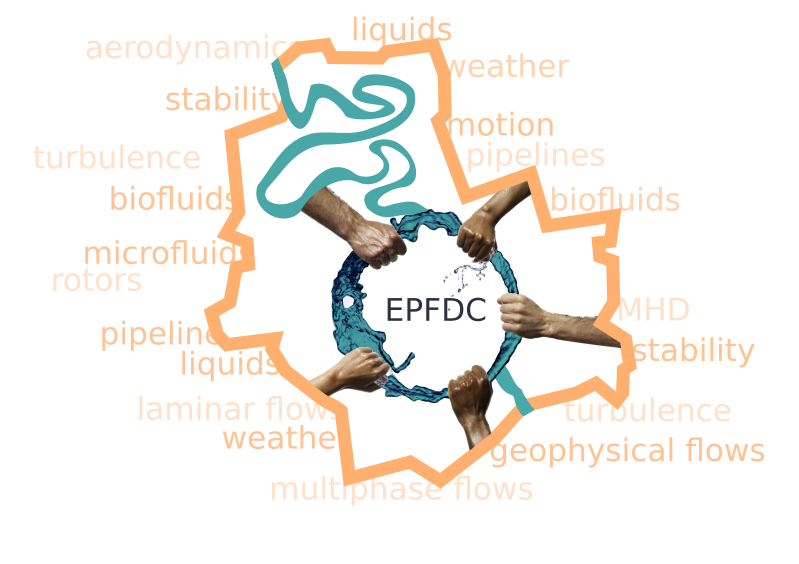 While preparing the introduction to your presentation please take into account that the EPFDC conference audience has a broad spectrum of scientific background. All the speakers are asked to come before the first session on their presentation day (before 9 AM) to the conference hall to test their presentation. The conference computer with basic software will be available for the speakers’ use. If you are going to use your own computer please make sure that you bring your own adapters for HDMI or VGA connectors and that there is good resolution adjustment. Mac users are asked to put special attention to compatibility issue. Those who expressed their will in the registration form to take part in the competition are allowed to take part in Outstanding Presentation Award contest. The poster session is going to take place in the different place than all the oral sessions: at The Faculty of Power and Aeronautical Engineering of Warsaw University of Technology, 24 Nowowiejska Street. Together with the poster session a visit to the aerodynamic laboratories with both historic and brand new laboratory facilities will be organized. Size of a poster board is 1.0 m x 1.2 m (width x height). Posters will be attached to the board by organizers with the use of magnets so please bring your poster in one piece. There is no possibility to use adhesive tape or any kind of a pins on the poster boards. Participants who are presenting their poster are obliged to leave the poster to conference staff during the conference registration (2-5 PM at 6th of July or 8-9 AM at 7th of July). Posters will be then transported to the poster session venue and posted up. The poster removal time is the end of poster session, 8 PM, 7th of July. Those who present the optional poster “elevator pitch” are allowed to take part in the competition for Outstanding Presentation Award. We offer you a possibility to advertise your poster to the whole conference audience even before the poster session during 2 min presentation done in a form of elevator pitch. Those who prepare the “elevator pitch” and expressed their will in the registration form to take part in the competition are allowed to take part in Outstanding Presentation Award contest. In case you want to use slideshow for your short presentation it needs to be prepared in the pdf format and send to us via email before the conference (title: "RegistrationNr_Surname_FirstName.pdf", ex. 11_Karpinska_Katarzyna.pdf) or copied to the conference computer at 8 AM on the first day of the conference (7th of July). All participants will have an occasion to honour the oral presentation that was extraordinary in their opinion. Each participant will get a voting card with the conference set. The voting cards will be collected in the end of the conference on Saturday. In case of leaving early it will be possible to vote by putting your card in the special box placed in the lounge. The 3 best presentations of oral sessions and one of the poster elevator pitch session will get the Outstanding Presentation Award sponsored by Foundation Universitas Varsoviensis. Conference proceedings will be published in Archive of Mechanical Engineering. Participants interested in publication has to follow revision process (typical for article submission). Submissions will be gathered all together and published in one, two or three consecutive issues, depending on number of accepted articles. In order to provide relatively short time of publication all proceedings has to be submitted before July 31st. As it is difficult to predict duration of revision process for such a large number of submissions, we can only guarantee that proceedings will be published as soon as it will possible. All informations regarding preparation of articles can be found on Journal website (Instructions for Authors - direct link here). The main part of the conference will take place in the Faculty of Physics of University of Warsaw at the “Ochota Campus”, 5 Pasteura Street. Poster session will take place at The Faculty of Power and Aeronautical Engineering of Warsaw University of Technology, 24 Nowowiejska Street. A detailed map with routes is available here. Accommodation in the Reduta Ibis Budget hotel in double and triple rooms with breakfast included is provided for all participants. The accommodation (when paid with the conference fee) is provided for the days of the conference, that is from 6th to 9th of July (3 nights: 6th/7th, 7th/8th and 8th/9th of July). Check-in at the hotel starts at 14:00 on 6th July and check-out finish at 12:00 on 9th July. If you arrive earlier than check-in hours you will have the opportunity to leave you luggage in locked room at the conference venue. There will also be such a possibility in the morning on the last day of conference. The hotel is located within 10-15 minutes walking distance from the conference venue. Every room is equipped with separate beds, table with chair, toilet. Please note that there is no independent room for shower and basin, they are entered directly from the main room. There is a TV and free internet access in each room. Breakfasts served at the hotel contain: a selection of breads and cereals, cheese, ham, butter, jam, hot sausages, tea, coffee and orange juice. Single room accommodation will be offered to a limited number of participants on a first come first served basis for an extra fee of 30 Euro in total. 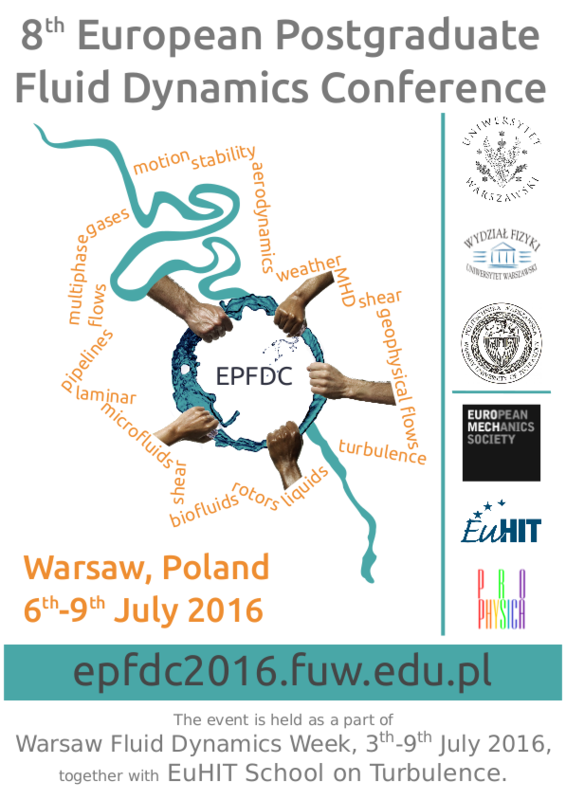 Participants of the whole Warsaw Fluid Dynamics Week will be accommodated in the same room during the event. If you are willing to seek different accommodation please take into account that there is NATO summit in Warsaw planned for 8-9 July which influences significantly room availability and accommodation prices in the days 7-9 July. Warsaw is not only a creative place for science but has many interesting sights and attractions. Please find many interesting events under this link. We kindly ask all the participants to fill in the questionnaires that are included in the conference set to provide us with the feedback about the organization of the conference. There will be a special box placed in the lounge in which you can leave your form any time needed. Unfortunately we set the dates of the conference before NATO summit in Warsaw was announced to happen exactly in the same time (July 8-9) and we all will have to deal with the obstructions caused by it. There will be a lot of restrictions concerning public and private transport (including parking) in Warsaw, intensive controls at the airports and train/bus stations. Quite large part of the city would be totally closed during these days. Please read carefully all the information on the city page before coming to Warsaw. If you wish to travel by yourself in Warsaw during the conference please plan much more time for it than it seems to you to be reasonable in standard conditions. In case you would like to do some sightseeing in the Old City we recommend to do it on 6th, 7th or 10th of July. Please be ready for increased police and military presence and possible identity controls. Warsaw Chopin Airport is the largest airport in Poland and the main one in Warsaw. It is located around 6 km from the conference venue and about 11 km from the center of Warsaw in the south-west direction. Another possibility is Warsaw Modlin Airport, which is an airport for a low-cost Ryanair carrier. It is located about 36 km north-west from the center of Warsaw. The main railway station in Warsaw receiving international and long haul domestic traffic is Warszawa Centralna (Central Railway Station). It is located in the city center about 3.5 km north-east from the Conference Venue. In order to find an appropriate connection between any two points in Warsaw you can use the page warszawa.jakdojade.pl. It is also possible to install special application jakdojade.pl working online (available at Google Play, App Store, Windows Phone). Usually the changes in the schedule are quickly updated by this service but it shall not be completely reliable during the NATO summit. Buses and trams are the basic means of public transport; they run according to the timetable displayed at the stops, approximately from 5:00 a.m. to 11 p.m.; from 11 p.m. to 4:45 a.m. night buses are in service. The tickets can be bought at kiosks (newsagent’s shops), ticket machines or from the driver (in case you have the exact amount of money prepared). There are also weekend or group-weekend tickets available. Additional information concerning public transportation in Warsaw is available here. In Warsaw, there is also an underground. Now the Warsaw underground has two lines running south-north on a left bank of the Vistula River and west-east. These trains run daily between 5:00 a.m. and 0:00, every few minutes. On the weekends they run also at night till 3:00 a.m. The nice alternative to the standard transportation in Warsaw are city bicycles working in so called Veturilo system. It is quite easy to register on their website and start using them. What is important first 20 minutes of the ride is for free. For more information please visit en.veturilo.waw.pl. The cheap, low-standard taxi companies are for example Eko Taxi (+48 22 644 22 22), Opti Taxi (+48 22 33 11 999) or Bayer taxi (+48 22 19667). You can make the comparison between different companies on a specific route here (only in polish). In order to plan the trip to the main conference hotel from any point of the city please use the page warszawa.jakdojade.pl. Warsaw/Modlin Airport is situated 35 km north-west from Warsaw, on the city limits of Nowy Dwór Mazowiecki. The cheapest way to get to Warsaw is to take a bus to Modlin city and then change for a train of Koleje Mazowieckie company (bus timetable). There are also Modlinbus buses going directly to different parts of Warsaw and they are usually a little bit more expensive that bus-train connection. Of course there is also taxi service available at the airport. You may find all the details here. Warsaw Chopin Airport is located in the city limits of Warsaw and there is well organized public transport connecting this airport with differentparts of the city (see here). A lot of taxi companies are available too. Due to the problems caused by the NATO summit we are going to organize a walk (2.5 km distance) to the The Faculty of Power and Aeronautical Engineering, Warsaw University of Technology just after the poster elevator pitch session. The exact route is shown on the map. If you are not willing to walk please check jakdojade.pl website for public transport or take a taxi. Due to the problems caused by the NATO summit there will be organized group transport just after the last session to get to the party place with the use of public transport. Most probably it will combine walking to the Metro Pole Mokotowskie station (2 km distance) and using two metro lines to get to Dworzec Wileński (then 1.3 km distance to get to La Playa). The details will be announced soon. If you are going to get there on your own we do not recommend using taxi - there will be most probably a huge traffic jam everywhere. Quite safe alternative to walking to the metro station is taking a direct tram line no 1 from the nearby tram stop Banacha to Wybrzeże Helskie and then walk to the south along the river to the La Playa (1 km distance). The only risk is that all the trams from the closed closest bridges will be going along the same way what could make the journey longer than usual. We are truly convinced that networking is one of the most important conference purposes for the young researchers at the early stage of their career. That is why we planned two social events during the conference: The Welcome Party (joined with EuHIT School on Turbulence) and the Beach Party. We tried to organize the poster session in the cosy atmosphere as well to induce intense scientific discussion. We hope that rich social programme would bring us the benefit of becoming young community of fluid dynamics. Please remember to take your conference id to all of the events! Osada is around 3-min walking distance from the Ibis Budget Hotel. This is a barbecue place with an open garden. The variety of barbecue dishes will be served. The welcome party is going to be a short informal warm-up event. Very unconventional lecture with show is going to take place at 18:30. Because of the European Championship semi-final display taking place our reservation ends at 21:00. La Playa is a music bar beautifully located at the wild bank of Vistula River with the view at the Old City towers which offer a whole spectrum of activities. We are going to get there together around 19:00. There is possibility to play beach volleyball, frisbee, badminton or bule. We will have at our disposal a separate tent, a private bar and catering service. The dance floor is placed outside the tent and is open for other customers of the bar. We provide free internet access at the conference venues. At the Physics Department of The University of Warsaw internet can be accessed through eduroam and FUW.open networks. At the Faculty of Power and Aeronautical Engineering of Warsaw University of Technology internet can be accessed through eduroam network. A the Ibis budget hotel there is free internet access. Those, whose abstracts were not accepted in the first place due to the limit of participants, now after extending the limit, are allowed to register for the conference with the poster presentation. The deadline for registration and payment of late conference fee is 1st of May. Late abstract submission starts 1st of May and last only till 4th of May. It concerns only poster presentations. There is limit of additional submission slots and after limit saturation the process will close (first come-first served). The acceptance notification letters for late submission shall be sent until 8th of May. From 9th of May till 18th of May there will be special registration open for these participants. Deadline for payment is 18th of May. 150 PLN (ca. 34 EUR) - includes conference fee and EuroMech membership, no accommodation. 44 PLN (ca. 10 EUR) - includes conference fee, no accommodation. 660 PLN (ca. 155 EUR) - includes conference fee and EuroMech membership, no accommodation. To confirm your registration please make the payment of adequate conference fee so we receive it not later than in 7 working days and 1st of May. Payment must be made by a bank transfer only, in polish zloty (PLN) with the transfer and exchange cost entirely paid by Sender. Please take into account that the final sum of money received must equal the expected conference fee in PLN regardless of additional costs. It is possible to obtain an official payment and participation confirmation during the conference. If you require an invitation letter to apply for a visa, please contact us by email: epfdc2016@fuw.edu.pl providing all the necessary information. The page of Ministry of Foreign Affairs might be of use. Travel grant application will be available for those who also register for the EuHIT School on Turbulence and fulfill the school requirements. During the conference participants are obliged to be members of European Mechanics Society. In case you do not have EuroMech membership you will be able to register during conference registration within one form. There are two possibilities: purchasing one year membership (24 EUR) or one-time membership for the days of the conference (24 EUR).